Indiana Jones and the Kingdom of the Crystal Skull is one of the most anticipated sequels of the summer movie season. For the curious, it is because they want to know whether director Steven Spielberg and producer George Lucas can recapture the "lightning in a bottle" that made the original trilogy so popular. For fans of Harrison Ford, it is because they hope that a return to his most popular character will jump-start his sagging career. For me, it is a chance to relive the thrill of going to a movie with my family that they are all eager and excited about going to see at the multiplex. My dad, who is an infamously impatient man when it comes to sitting still and watching a movie, was a huge fan of Raiders of the Lost Ark. So much so, that he took us to see it countless times. In fact, we saw it in Miami at the Lincoln Theater (now home of the New World Symphony), on a double bill with Robert Altman's Popeye, back when theater ushers carrying flashlights would personally seat you, and even allow you to stay for a repeat performance of the film at no extra charge. So we of course, saw Raiders, then Popeye, then Raiders again. My dad called me last week to make sure we leave some room to catch the new flick when I visit them in Miami this summer. 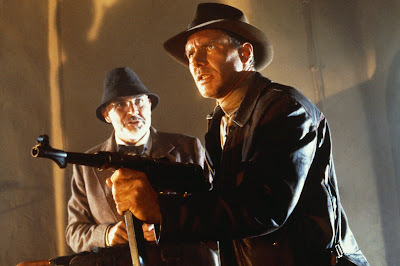 This weekend my new family, wife and son (with another on the way), had ourselves an Indy viewing party, and I've got a short buying guide to help you navigate through the various Indiana Jones DVDs currently available. Indiana Jones: The Adventure Collection - Just released this week, this box set contains special editions of Raiders of the Lost Ark, Indiana Jones and the Temple of Doom, and Indiana Jones and the Last Crusade. Each has all-new documentaries directed by famed DVD documentarian Laurent Bouzereau, and all-new introductions by Spielberg and Lucas. The best of these documentaries is "The Indy Trilogy: A Crystal Clear Appreciation", found on the Raiders disc, in which the cast of the latest film is interviewed with regards to their favorite moments in the trilogy. Each film is also available separately on DVD for the first time, for those who aren't fans of all the movies. The Adventures of Indiana Jones - This set, released in 2003, is for the true Indy fan. It contains all three films, and a fourth disc with over 3 hours of bonus material covering everything from the inception of the character (back when he was Indiana Smith) to audition footage of Tom Selleck as Indy (a role he no doubt laments being forced to give up, as CBS was strictly enforcing his contractual obligations to Magnum, P.I.). It also has in-depth coverage for each sequel. 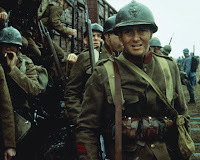 The drawbacks to this set were the unavailability of each film separately at the time of its release, and the fact that it doesn't have any of Bouzereau's new documentary material. So I guess if you are a rabid Indy fanatic, you'll be forced to buy both sets. In 1992, ABC broadcast a TV series based on the films, entitled The Young Indiana Jones Chronicles. Each hour-long episode was introduced by a 93 year-old Indy (George Hall... wearing an eye-patch), who would then recount a story of his exploits as a 10-year-old boy (Corey Carrier) or as a young man age 16 to 21 (Sean Patrick Flanery). Spearheaded by Lucas (with no involvement from Spielberg), he had a dual intention with the series. Primarily, he hoped that its more educational tone would inspire teachers to use it as a starting point for class discussions, as Indy would meet many famous figures of the period (1908-1920) in his adventures. Secondarily, as much of the budget was utilized to travel to actual locales around the world, he used the show to experiment with, what were at the time, new CGI effects, the results of which would manifest themselves in the second Star Wars trilogy years later. The tone of the show was quite different. More Masterpiece Theater than "Republic serial," many fans of the movie were turned off by the often ponderous stories. Also, while Flanery's teenage Indy was charming, the 10-year-old, and 93-year old were not popular. What the show did have going for it, was its wonderful location shooting, its talent behind the camera, its use of young actors who have since gone on to greater fame, and of course, Flanery, which led to the lion's share of the episodes utilizing him. The action was amped up, and Harrison Ford was even brought on board for a rare guest appearance as a 50-year-old Indy introducing one of the adventures. But all to no avail, as the show was cancelled after its second season. Now available for the first time on DVD as The Adventures of Young Indiana Jones, Lucas, ever the revisionist, has revised the concept yet again. Deleting all of the introductions by Old Indy (except for Ford's), he combines two hour-long episodes to form a movie. While sometimes leading to some unevenness, it is a much more effective presentation. And in keeping with his primary motivation of educating while entertaining, each episode is paired with about 5 to 8 half-hour documentaries that inform viewers of the historical figures and events Indy encounters. These are so interesting I found myself excitedly anticipating the next one more than the actual episode itself. Volume One: The Early Years - This one covers Indy's adventures from 1908, when he tours the world with his parents, to 1916, when he runs away from home to join the Belgian army during the early days of World War I. He meets Picasso, Puccini, Freud, and Pancho Villa. While the earlier bunch of episodes starring the young Carrier can be tedious, they are greatly aided by deft direction from folks like Mike Newell (Donnie Brasco) and Bille August (Pelle the Conqueror). Once Flanery comes into the picture, the series really takes off. Look for guest appearances from, Max Von Sydow, Vanessa Redgrave, and a young Elizabeth Hurley. Volume Two: The War Years - By far, the best of the three volumes, this covers Indy's sobering experiences in the war with no small amount of poignancy. And why shouldn't this one be the best? With talent like Frank Darabont (Shawshank Redemption), Carrie Fisher (Postcards from the Edge), Nicolas Roeg (Don't Look Now), and Simon Wincer (Lonesome Dove) behind the camera, and guest appearances by Catherine Zeta-Jones and Daniel Craig, this volume is the highlight of the show. Volume Three: The Years of Change - Still better than the first, but a shade less interesting than the second volume, as Indy returns to America. He meets some famous folks while attending the University of Chicago, like Eliot Ness, and Ernest Hemingway, before heading to Hollywood to become a... stuntman!? Guest stars in this one include Harrison Ford, Anne Heche, and Jeffrey Wright. These three volumes of Young Indy's adventures are a wonderful introduction to the character geared towards younger fans. And if you stick around to watch, you might learn something, too. Still provided courtesy of Paramount Home Entertainment. This entry first appeared on Blogcritics on 5/14/2008.